Sorry for being absent, but certain books take a while to finish reading. In this case almost 11 months! Aomame lives her own life. She is single, alone and has a job she is good at. One day on her way to a client she follows the suggestion of her taxi driver to climb down a staircase of Express Highway 3 and all of a sudden her world isn’t the same anymore. 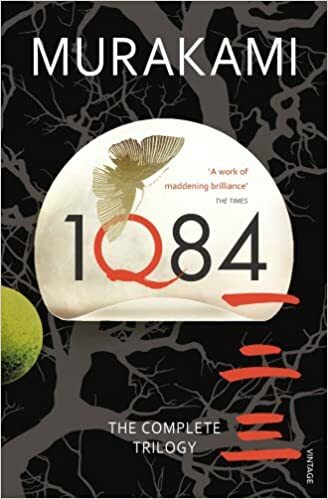 Certain details about the world are now changed, she has entered, what she calls, the world of 1Q84, where the Q stands for a question mark. Tengo Kawana lives by himself, teaches math at a cram school and writes short novels on the side. One day he is approached by his editor and mentor, Komatsu, who asks him to participate in rewriting a novel by a young writer named Fuka-Eri. Komatsu wants to enter the novel, after Tengo has rewritten it, into a novel competition, but this novel and its author will be life-changing for Tengo. One of the biggest changes is that there are now two moons in the sky. Tengo gives this new reality the name of The Cat Town. The narratives of Aomame and Tengo run along each other with some time jumps along the way. From time to time these time jumps can be kind of confusing and they threw me off at some points. When that being said, I have to say I’m not too fond of Haruki Murakami’s writing style. I feel like I’m really stepping on some toes here, because I’ve always heard such great things about his writing, but I just don’t like it. To be quite honest his writing bores me. I struggled a lot to follow the book, which is probably why it took me almost a year to finish it. That, a number of times I fell asleep while reading it. I’m pretty sure that for someone who is more into this kind of fiction and fantasy will enjoy it way more than I did. I do enjoy a good fiction/fantasy book, but this might have been a little too much for me. You can’t love them all right? The story isn’t necessarily bad. It has a cult, magical creatures, mystery, two people who have been secretly in love for 20 years, a detective and The Little People (#spoileralert). There are quite a few details to hang onto and at some points, I was able to connect some very strange strings that didn’t seem to make sense when they were first revealed, but that’s how it is supposed to be right? There is also quite a few things that don’t make sense and I think that is what frustrates me most while I read this book. I prefer things to be wrapped up in the end with a nice and tight little bow and this time that didn’t happen. When I finished this book there were several things I still didn’t understand. Like for example, in the case of The Little People. I still don’t understand the whole concept of them. When they were introduced to the book I thought they were an interesting concept. This was something I had never heard about or read about before, but they are way too complex and not properly explained (at least not that I caught onto). I finished the book without understanding them any more than when I started the book. So, I guess, mental note to myself; If the book takes you almost a year to finish, maybe it is not for you, haha.